A little introduction of lazy loading is it is a design pattern to defer the initialization of an object until the point at which it is needed. In simple words create objects when it is needed. Scrolling is blocked / interrupted – Downloading images from server OR loading from device local storage is heavy task and it may take some time. If you load images directly in getView() method of Adapter then it blocks the UI thread and your ListView scroll will be interrupted and not smooth. You need a mechanism to load images in a worker (separate) thread and show a place holder image until the image in not downloaded and placed in memory for fast access. Remember accessing images from Hard disk may also takes some time. App Heap Memory can overshoot – If we load many images in memory for faster access by ListView / Adapter, then memory (heap memory) allocated to the application might overshoot and app will crash with Out of Memory (OOM) error. Work with Recycling of Views can be tricky – When image is downloaded we need to decide when to set a particular image in its ImageView of that row it is meant for. It may be possible that the ImageView object will recycle and it is given to another image and we end up showing wrong image. We need to create a balance among above 3 locations for optimum utilization of accessibility and memory space. Bitmap Cache Map (Unique Id of Row TO Bitmap of Image) – LruCache class provided in Android SDK to store images in memory (Heap) will be used here. LruCache will act as cache and will also recycle the images after a certain limit is reached. ImageView Recycler Map (Row ImageView Object TO Unique Id of Row) – We will maintain a mapping of ImageView and Id of Row to identify visible views and accordingly set images on ImageView. Image Loader / Downloader Queue (Unique Id of Row TO Row ImageView Object TO URL of Image) – Queue of requests to load images (if available) from device local storage to Bitmap Cache OR download images from server and store them in device local storage and then place in Bitmap Cache Map. Image Download Tracker (Image URL TO Status of Download) – This will map the URL and the status of image that is being downloaded from the URL. It is possible that request to download the same image comes and that image is already in process of downloading. This tracker will help to ignore such requests. 1. User comes to ListView. Adapter.getView() is fired for a single row. getView() will make an entry in ImageView Recycler Map with ImageView. 2. The image (ID1) is checked in Bitmap Cache Map. If the image is found in Bitmap Cache Map, it is set in ImageView and displayed. If the image is NOT found in Bitmap Cache Map, a place holder image (Default Image) is set in ImageView and a new request is queued to load it from device local storage OR download the image. 3. Process the request from the Queue. CHECKPOINT 1 of 3 – It is possible that by the time request from the Queue is picked up for loading the image from local storage or downloading image, ListView has been scrolled by the user and ImageView object is recycled and allocated to other row with a different ID. So, we don’t need to download this image as it is not currently shown. Mapping of ImageView (IV1) and Unique ID (ID1) is checked in ImageView Recycler Map for that. 4. Load the image into Image Bitmap Cache if image is available on device local storage else downloading image. This is to be done in new thread. If mapping (See CHECKPOINT above) exists, image loading / downloading from server starts else we simply return from thread and that request to load / download is dropped. 5. If the image is available on device local storage Or it is available after downloading from server, it is put in Bitmap Cache Map and send for display. CHECKPOINT 2 of 3 – It is possible that by the time image is to be loaded from device local storage (Either already available OR after download), ListView has been scrolled by the user and ImageView object is recycled and allocated to other row with a different ID. 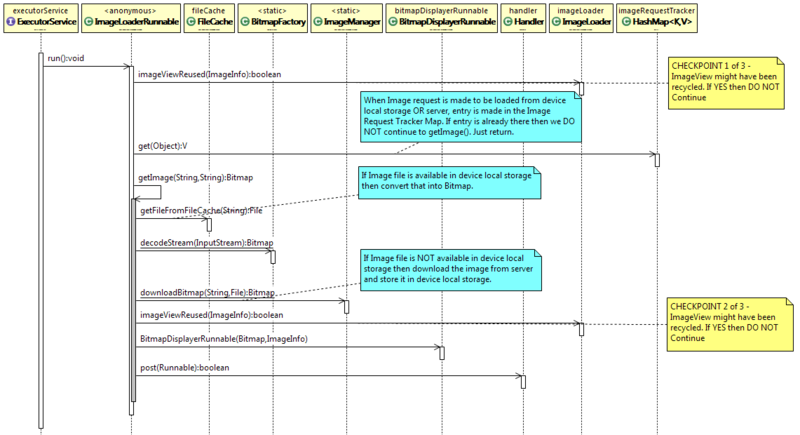 Mapping of ImageView and ID is checked in ImageView Recycler Map for that. If ImageView has been recycled, we don’t need to place this image in Bitmap Cache Map. But keep it on hard disk. 6. To display the image on ImageView we post a Runnable on the UI Thread using the Handler. CHECKPOINT 3 of 3 – Just before image is set on ImageView we again check in ImageView Recycler Map if the Mapping of ImageView (IV1) and Id (ID1) exists. If the mapping exists we set the image on ImageView else the place holder (default) image is set. I created Android library project for this and can import in Android application project. To use it you just have to instantiate an instance of ImageLoader class and call its method displayImage() from getView() method of Adapter. ImageLoader – This class provides Lazy Load concept. It uses Thread Pool to download images in parallel in worker threads . It also uses LruCache provided by Android to store/load images without any extra efforts for memory management. ImageLoader Class handles the Images to be displayed in ListView, Load images from cache or queue them to be download from web server (load from external storage). 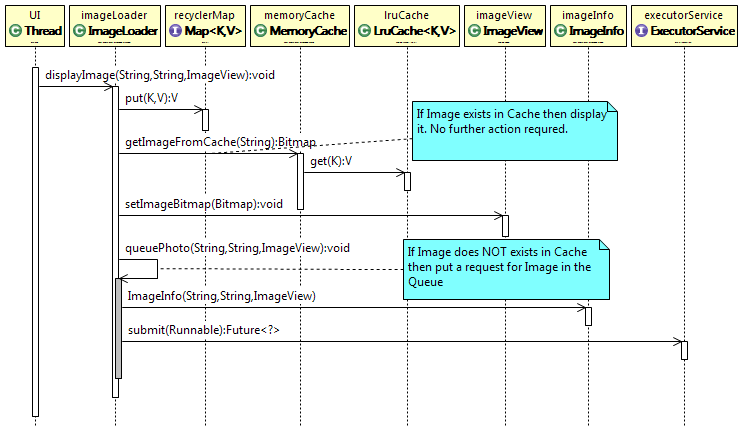 MemoryCache – It contains a LruCache object. LRUCache is a caching strategy where we use Least Recently Used (LRU) eviction policy when the cache is full and we want to add more new data to the cache. LruCache is given fixed size (Either number of items or size in kilobytes) to store Bitmaps. When we add more Bitmaps the least recently used Bitmaps will become candidates for garbage collection. LRUCache cache was introduced in API level 12 (3.1) but is available through the Support Library back to 1.6. FileCache – Used to create folder in external storage (or sdcard) and also clear images from file when specified memory limit reached. BitmapDisplayerRunnable – This is for placing the image in the ImageView.